Many figurines showing Isis and Horus were made to be dedicated to one or both deities as votive offerings. A large number of examples in bronze are known, but specimens in faience such as this are less common. Here the workmanship is detailed and fine. The rich blue-green color of the glaze has been offset by a purplish coloring applied to the wig of Isis. The goddess wears on her head the image of a seat or throne (the hieroglyphic sign for her name). She clasps her right breast with one hand and with the other hand supports the head of her son to suckle him. 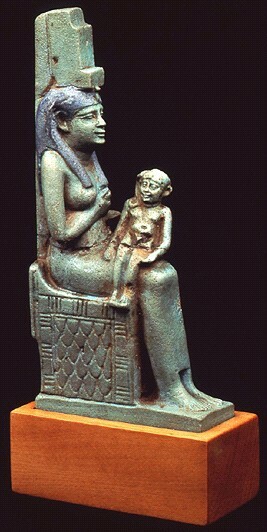 Horus sits passively on his mother's knee; his head is shaven but for the curled sidelock of hair, denoting his youthfulness.